Old Sturbridge Village is an outdoor living history museum in Sturbridge, Massachusetts. Dedicated to representing New England Village life of the 1790s to the 1830s, the village is a New England institution. 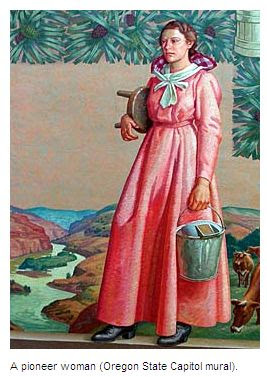 OSV (as they frequently abbreviate it) was founded in the 1930s. Unlike Colonial Williamsburg or Arrow Rock or similar outdoor museums, OSV does not preserve an actual town. The village is rather a recreation of a "typical" (and perhaps romanticized) country town of the era. The 40+ buildings are mostly historic structures gathered from across the region and transplanted to the site. A few are modern reconstructions. The interpretive staff at OSV wear period costumes but are not in character--that is, they do not pretend to be persons from that time period, as many interpreters do at Colonial Williamsburg. I found this a relief--I think the play acting at CW can get in the way of the historical interpretation and creates a barrier between the interpreters and the visitors. I don't have time here for a long critique and analysis of how history is presented at OSV. (Though perhaps that would make a good article.) Suffice it to say that the presentation is excellent, if tending to the idyllic. This is the New England village of Currier and Ives prints. It is wonderfully scenic, and true in its way. And to their credit some of the interpreters and signs did try to emphasize that life was hard in that era. Overall, however, the impression of the place is that people in the 1790s lived simple, happy wholesome lives. The children at OSV seem to have played more than worked, the houses are bright and airy rather than sooty and stinky, and the chamber pots are freshly scrubbed. In particular there is very little interpretation of the crushing rural poverty of many families in that era, such as is discussed in Alan Taylor's Liberty Men and Great Proprietors. And yet, what else are the Great Proprietors of Old Sturbridge Village to do? Though non-profit, the organization needs ticket revenue to stay afloat. Adding some muddy, grim little huts to visit and having the interpreters pee in the chamber pots each morning is hardly an option. All of the living history sites are like this: lacking in the dark, stink, poverty and early death of authentic history. Quibbles aside, OSV is a magnificent place to spend a early summer day and learn about early American history. It is rightly one of the top historic destinations in New England, every bit as important to visit as Boston's Freedom Trail. The newsletter of the Association of College and Research Libraries this month offers a terrific roundup of websites with deep collections of historical primary source images online. Relevant to PNW history are the Alaska Digital Archives, the University of Washington Digital Collections, and Calisphere ("a free online collection of more than 150,000 digitized primary materials contributed by libraries, archives, and museums from all over California"). It is from Calisphere we get the image below, "Bridge over Spokane River, downtown Spokane, Washington" [undated]. I love good history podcasts. This post over at MetaFilter points to some terrific, professionally produced author interview podcasts by MIT, Harvard, Yale and University of California. See also the Making History Podcast and the Washington State Historical Society podcasts. If you know of any others, post them below. And watch this space for the announcement of the Northwest History podcast series, which I plan to initiate in the fall. This is a rare glimpse into the legal system of the native inhabitants of the region and how they understood the Whitman tragedy. Of course it hardly need to be said that the request was denied. Here is the trial verdict. More on "Digital Images at the Beinicke"
"Cheyenne warrior and son of Cheyenne chief Eagle Head. He was imprisoned from 1875 to 1878 at Fort Marion, Saint Augustine, Florida, with other 'hostile' Prairie Indians. 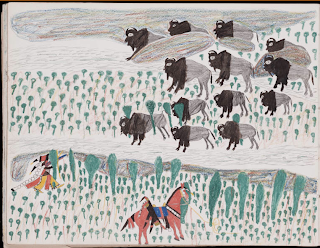 Their jailer, Captain Richard H. Pratt, encouraged the artistic talent of the Indians." The metadata also includes "Subject" -- useful for more searches -- "Genre/Form" and, in this case, a link under "Multi-Image set" allowing you to choose to "See all Images in this set." This brings you to 20 sketches by Howling Wolf. One of the marvels of the web is the way that it can help us find connections between so much data of so many kinds. After reading the note above about Howling Wolf's "jailer," Richard H. Pratt, I immediately liked the man. Here is someone who respected the Indians so much that he encouraged them to express themselves and their lives in art. I wondered how long he could have lasted in those days as a culturally sensitive benefactor to the Indians. A quick Google search, suggests that his story is much more complex, for Pratt, it turns out, is responsible for one of the most notoriously ethnocentic statements ever uttered about educating Native Americans: "kill the Indian, save the man." Building on his success at Fort Marion he became a leader in Indian education and persuaded some of his Indian pupils, once free, to recruit young Indians to attend the Carlisle Indian School, which he founded. There is much more to this story, of course. 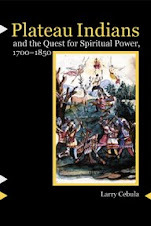 For the moment the point is simply to illustrate the power of the Beinicke digital images, backed up with excellent metadata, to drive historical inquiry. Thanks for the "heads up," Larry. Beinecke's Digital Images Online offers approximately 70,000 images of a wide range of materials from throughout the Beinecke Collections: photographs, manuscripts, correspondence, artwork, objects, illustrations, and selected pages from printed works . . . Approximately 1200 images are added every two weeks. About 20,000 images are scanned images from the Beinecke's Photonegative File, which contains negatives and color transparences of images selected for reproduction or study by patrons over the last twenty years. The site is well-designed, with a powerful search engine and the ability to display results as a gallery or slideshow. You can link directly to the images and once you find something you can see all the images in a given set. Yale patrons can create an account and save items, but the rest of us can use the direct link and a service such as Del.icio.us to do the same thing. 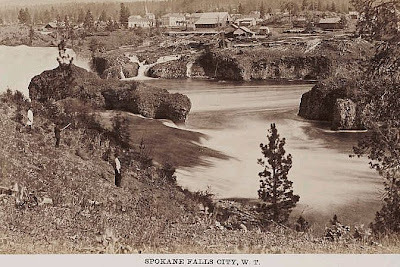 The above image of Spokane Falls in 1879 is from the delightfully titled Oregon and the Pacific Northwest. Glimpses of Pretty Spots Along the Valley of the Columbia River (1879) by Isaac Grundy Davidson. Here are the other images in the volume. Though the collection is at Yale the Northwest and West is surprisingly well represented--try searches for Seattle, bison, or salmon for some delightful images. Another good video from the Spokesman Review, Saving Salish tells the story of a night class at Havermale High where students are learning this endangered native language. Something of a follow up to this post and to this one. Alan Taylor: I set out to find the longest distance for which Google Maps would give Driving Directions. Now that they've shut down the fun "swim the Atlantic" feature, things have changed a bit. It turns out there are multiple "longest drives", because the Google Maps World is partitioned (many countries don't support driving directions), and sometimes ferries are included, and sometimes they are not. I am not sure what this does for us, it is just kind of neat.